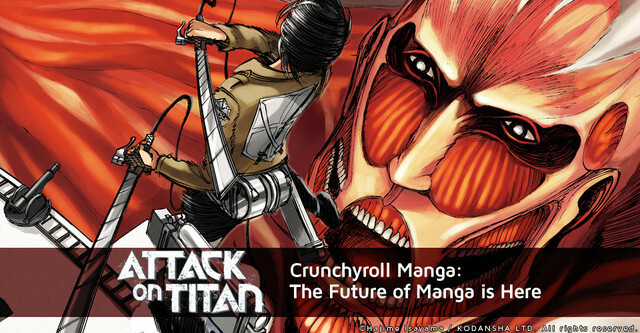 Kodansha Comics, the main manga publishing arm of the Japanese company have teamed up with Crunchyroll to create Crunchyroll Manga, an online "simulpubbed" platform to allow subscribers and free users to read the latest chapters from current manga being published in Japan. Free users would have to use the service with ads while subscribers can read the latest chapters without the ads and can access the archives of the titles to read previous chapters. The service is set to launch on the 30th of October. There will be twelve titles available on launch with fifty on the service by next summer. Following title list is from Cruncyroll's article. A dramatic action-adventure where humans must battle mysterious giants for survival. Currently one of Japan’s most popular manga, it has recently inspired a hit anime streaming on Crunchyroll now. Award-winning manga about two siblings struggling to fulfill their childhood dreams to become astronauts. Inspired an anime series now streaming on Crunchyroll as well as a live-action movie. From the creator of "Negima!" comes this fantasy set in a future where the existence of magic has transformed the world and a boy named Tota must leave his home village on the path of adventure. A tale of addiction and lovesickness revolving around a strange bond between classmates Urabe and Tsubaki. Also inspired a popular anime series. School, relationships, and comedy are combined in this manga about a girl who moves from the city to the countryside. Two students – a boy and a girl – unexpectedly swap bodies and must uncover the secrets of the "Seven Witches" at their school, who each possess a different power. Recently adapted into a TV drama. What seems like just another boring day at school becomes a deadly and surreal game, and student Shun Takahata must find out who is behind it. One day, a girlfriend-less student wakes up 10 years in the future to discover he is married to the prettiest girl in school. How did it happen and where is their relationship going? Accused of a crime he did not commit, a young boy is sentenced to life in prison only to find himself at the center of an outbreak of zombies! In this comedic fantasy adventure, a princess goes on a quest to reassemble a disbanded group of knights when her kingdom is taken over by the evil Holy Knights.